WASHINGTON ― The Trump administration is considering prosecuting state and local officials for not fully cooperating with Immigration and Customs Enforcement, the agency’s acting director said Tuesday in an escalation of his threats against so-called “sanctuary cities” and the undocumented immigrants who live in them. 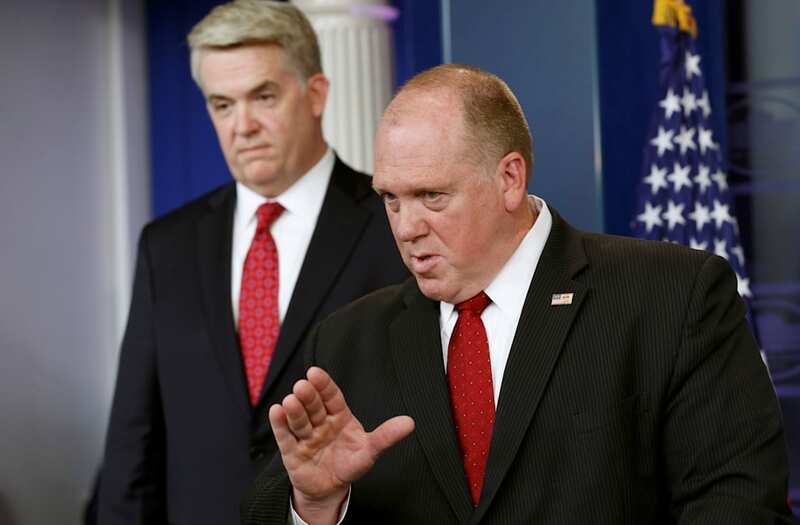 The Justice Department did not rule out acting on Thomas Homan’s suggestion. An official told HuffPost on Wednesday that the department is working with ICE “to explore any and all potential options” for reining in jurisdictions that limit their assistance with federal deportation efforts. But Homan’s plan is likely unconstitutional, legal experts say. And the acting director’s argument that sanctuary cities are protecting hordes of dangerous criminals isn’t backed up by his agency’s own data. Recent reports from the Department of Homeland Security, which includes ICE, show the Trump administration itself is increasingly cracking down on petty offenders, not violent felons. Homan, who is also President Donald Trump’s nominee to permanently lead ICE, laid out his threats during a Fox News interview on Tuesday. He said that ICE would dramatically increase its own enforcement efforts in California in response to the state’s new law limiting police cooperation with immigration officers and that the federal government should consider lawsuits and funding cutbacks against jurisdictions that pursue sanctuary policies. Public officials should be held “personally accountable” and criminally prosecuted under a law against harboring unauthorized immigrants, he said. ICE did not respond to a request for more information on who Homan thinks should be prosecuted. “We’ve got to take these sanctuary cities on, we’ve got to take them to court and we’ve got to start charging some of these politicians with crimes,” Homan told Fox News. “California better hold on tight,” he said in the same interview, vowing to send more ICE officers to the state. The big problem with Homan’s lawsuit plan is that there are no grounds for criminal prosecution of public officials in these situations, according to several legal experts. Laws merely limiting cooperation with ICE don’t amount to illegal harboring of undocumented immigrants, said Thomas Saenz, president and general counsel of MALDEF, a Latino civil rights organization that fought anti-sanctuary city legislation in Texas. Besides, criminal prosecution requires personal involvement in wrongdoing, he added. The way to hold public officials personally accountable in a democracy is by regularly scheduled elections or recall votes, both of which are options in California, Saenz argued. Criminal prosecution of local officials who don’t, say, hold undocumented immigrants until federal authorities arrive would also run right into the 10th Amendment, which prevents the federal government from forcing state and local authorities to use their resources to enforce federal law ― something that has been used to block past Trump efforts against sanctuary policies. ″No matter how much the federal government may not like that, unless they’re to seek a repeal of the 10th Amendment, Homan should shut up and get out of town because he has no legitimacy in the position he currently occupies, having engaged in threats that are more akin to a totalitarian thug than to our government,” Saenz said. Using the threat of prosecution or an actual prosecution to retaliate against officials who have spoken out against the Trump administration would also be a “very serious infringement” of those officials’ First Amendment rights, said Cecillia Wang, deputy legal director of the American Civil Liberties Union. As for Homan’s insistence on Tuesday that “more citizens are going to die” if places like California adopt sanctuary policies, he was echoing comments that Trump has made ever since the 2016 campaign. But there isn’t much data available to support that assertion. The violent crime rate in California plummeted from 1,045 per 100,000 in 1990 to less than half of that by 2014, according to the FBI’s most recent Uniform Crime Report ― that’s during a period in which the state’s undocumented population grew two-thirds larger. Recent Homeland Security reports indicate that the Trump administration is spending more resources on processing higher numbers of petty cases against undocumented immigrants, while casting aside Obama-era guidelines that focused on the much smaller number of individuals who were potential public security threats or had been deported before. Some 17 percent of people deported after being arrested by ICE last fiscal year in the interior of the country ― in other words, not those caught at the border ― had no criminal convictions. (The fiscal year ran from Oct. 1, 2016, to Sept. 30, 2017.) That’s a sharp increase over the 8 percent figure registered in the previous fiscal year. Of those who did have convictions, driving under the influence, “dangerous drugs,” immigration violations and traffic violations were the most common. A week after taking office, Trump ordered the departments of Justice and Homeland Security to compile quarterly reports showing how many immigrants were locked up on federal criminal charges. The latest report, released last month, said 94 percent of the 37,557 confirmed immigrants in federal criminal custody were undocumented. But most of the undocumented immigrants held in federal prisons and pretrial detention are facing prosecution for crossing the border illegally rather than any violent crime, according to data from the U.S. Sentencing Commission. Two-thirds of the non-citizens in federal custody in 2015 were imprisoned on an immigration charge, the commission’s report says. Immigration offenses accounted for nearly one-third of federal prosecutions, with about 20,711 cases. Even those lopsided numbers don’t capture the full picture. The Sentencing Commission’s numbers only include cases processed through the U.S. district courts proper. But most criminal immigration cases are handled by U.S. magistrate judges, who can adjudicate misdemeanor matters. It’s hard to be 100 percent sure without specific data, but it is overwhelmingly likely that the vast majority of undocumented immigrants locked up on federal criminal charges are prosecuted for immigration violations, said Cesar Cuatémoc García Hernández, a law professor at the University of Denver. Finally, although Homan and other Trump administration officials often describe sanctuary policies as if they fully cut off local law enforcement’s cooperation with ICE, most such jurisdictions in reality continue to share certain information with the agency and even hold individuals in particular situations, such as when the federal government provides a warrant or the person has been convicted of more serious crimes. California’s new law, for example, allows more extensive cooperation with ICE in cases involving about 800 criminal offenses. In other words, in most cases involving dangerous criminals, sanctuary jurisdictions don’t limit their cooperation with ICE. What the policies do is restrict local authorities’ participation in enforcing immigration law against people charged with lesser crimes or not charged at all. Supporters argue that this allows police to work better with immigrant communities. They also point to legal and financial concerns: It costs money to hold people on ICE’s behest, and if local officials do so without a warrant, they can be and have been sued. By threatening to prosecute local officials, the Trump administration is essentially trying to force them to abandon their own judgment about what is best for their communities, García said.